An idea of the project team Oststadt-Treff (Get-together in the Oststadt) for young and old, winners of the contest “Your SustainabilityExperiment” held by the project District Future – Urban Lab in cooperation with the civil foundation Karlsruhe. By creating spaces for encounters between generations and cultures, inhabitants of the Oststadt get the possibilty of meeting their neighbours, helping each other and developing a new way of living together. The Oststadt-Treff for young and old is a meeting-place for people of every age and origin. Getting to know each other, supporting one another, searching for help or offering help are only a few out of many aspects the SustainabilityExperiment Oststadt-Treff is about. 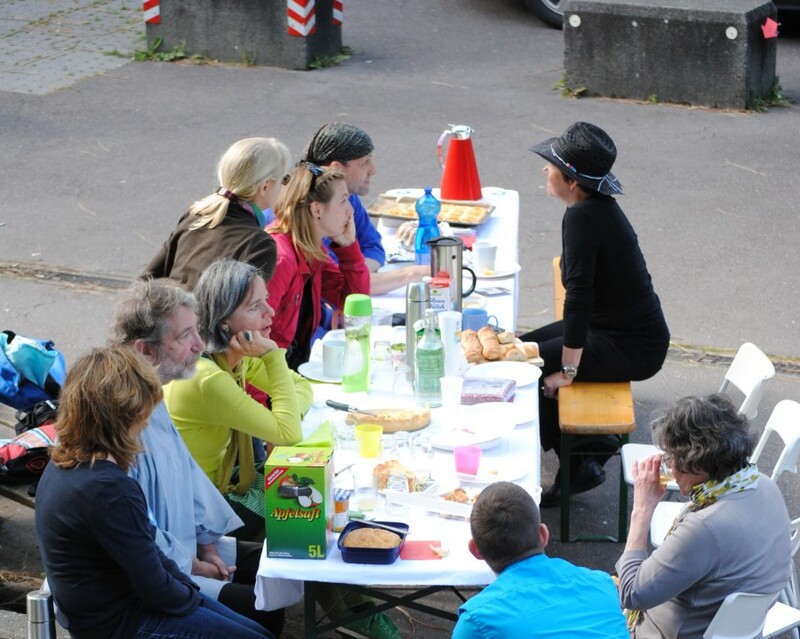 Every Monday, the residents of the district Oststadt get in cross-cultural and -generational contact with each other and thereby counteract the anonymity present in big cities. Removing shyness, insecurity and fear of the neighbourhood and promoting the attachment to the district and the people living in it. Oststadt-Treff is about actively taking time for each other, playfully rediscovering one’s own part of town and hence developing a sense of home and belonging. Oststadt-Treff’s program offers board games to play, handcrafting, hobby presentations, reading together, clothes- and plants-swapping events and much more. In addition, the Oststadt-Treff is organising monthly lectures and discussions in the evening which are mostly taking place in the Zukunftsraum.